Wu Chung hsin, Chairman of the Commission of Tibetan and Mongolian Affairs of the Nanking Government (second from left). He is wearing dark coloured silk robes and has glasses. 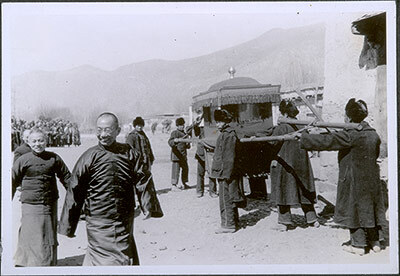 There is a sedan chair on the right being carried by Chinese retainers. The Tibet Album. "Wu Chung hsin walking towards a sedan chair" 05 Dec. 2006. The Pitt Rivers Museum. <http://tibet.prm.ox.ac.uk/photo_1999.23.1.28.4.html>.